There are two potential movies within Freddy’s Dead. One is a dark, scary and ultimately a fitting send-off for a character who began as a dream-invading bogeyman. The other movie is one which relegates Freddy Kruger to a comedy character, one who makes jokes, plays games and even quips to the camera with a raised eyebrow. Unfortunately, although the ingredients for both are there, it is the latter which Freddy’s Dead actually focuses on. This means that rather than wait and tease the return of Freddy Kruger after a three year absence from the screen, Robert Englund’s character appears within the first ten minutes as the “Wicked Witch of the West.” What then follows is Freddy playing around, killing a character with an over-sized chalkboard or literally playing a character to death in a video-game. It isn’t the hunting, terrifying character from the first movie, with the scariest elements now unrecognisable. This would be slightly forgiven if the rest of the movie made any sense but it is a muddled mess. Freddy’s true motives aren’t clear until he literally spells them out for a character, meaning that for the first half of the film at least, you are watching the generic teenagers walk around familiar locations and strange settings. This is made even more infuriating by the fact that there are some great ideas here. This movie delves into Freddy’s past. 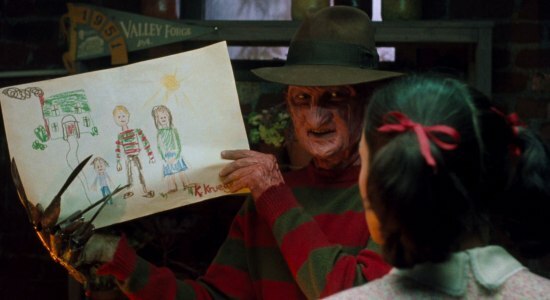 The story of his Mother and Freddy’s birth has already been covered but this looks at the time between and even establishes a family for Freddy Kruger. It hints at an abusive upbringing and strange childhood that could be a whole movie in itself (maybe a prequel? Before the Nightmare?) Unfortunately, this is covered in a scene which lasts less than ten minutes but is the most interesting ten minutes of the movie. The same for the “twist” in this film (established early on) that Freddie has a daughter who he his linked to. An idea worth pursuing but one which is completely wasted here and made into nonsensical storytelling by being rushed. The film feels like a wasted opportunity. Even the biggest strength of the film doesn’t quite click. Englund’s Kruger has always shone, even in the worst of the franchise, but here he struggles to be the chilling and nasty villain of the previous entries. He is having too much fun here, especially with the aforementioned gurning to the camera and playing videogames. It is a shame because this was supposed to be Freddy’s big send-off. The Final Nightmare wasn’t a rug-pull or ironic title as the ending of the movie has a finality to it which makes it feel special. If it had been the end of the character, this would have been a whimper of a finale rather than a bang. Luckily for Freddy’s legacy, there is at least one more instalment to come. Overall, Freddy’s Dead is both the title of the movie and an ominous description of the franchise itself by this point. This is not the Freddy Kruger who terrorises kids on Elm Street but instead a prankster who seems to be in on the joke. There is huge potential for an amazing movie which delves into the past and creation of Kruger but instead we get messy storytelling, lazy plot devices and an unrecognisable version of an iconic character.